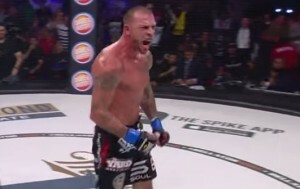 Joe Schilling is returning to the cage tonight at Bellator 210, for the first time since 2015, and the accomplished kickboxer says fans are going to see a different fighter. Schilling fought under Bellator’s MMA rules three different times in 2014 and 2015 and went 1-2. In his last MMA bout, at Bellator 139, he was knocked out by Hisaki Kato. Since then Schilling has been fighting under the Bellator Kickboxing banner and has gone 4-1. But, tonight at Bellator 210, the American fighter is going to return to the cage to face Will Morris. “At this point in my career I’m more committed to MMA,” Schilling said. “Kickboxing, I feel like I’ve gone as far as I can go, without being too cocky about it. There’s not too much more fans I can get, there’s not too much more money I can get (or) more promotion. I’ve been in the fight game since I was 15 years old, so what motivates me and keeps me going and working hard is the, ‘What’s next?’ MMA is next. Bellator 210 will take place in Thackerville, Oklahoma and the main card will be broadcast on the Paramount Network and DAZN.